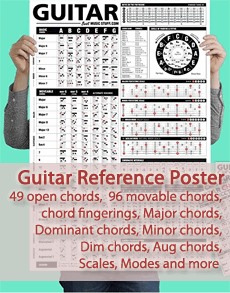 The chord chart or diagram is a schematic presentation of a chord, in this case for the guitar. Chord charts are the most advantageous way to learn how chords are played. If you are uncertain how to interpret charts, this guide will teach you that. The name of the chord. Fret positions (numbers explains the position of the chord on the fretboard). Finger placements (on this site, violet dots mark where you place your fingers). Strings (six horizontal lines represent the guitar strings; the thickest strings are to the left). Frets (vertical lines are representing the frets on the guitar). This diagram explains further how to read a chord chart. Look, it is the same chord! Every picture below shows a G chord. The last diagram is that Guitar-chord.org use and that delivers the information you need in a cut down design. The simplification makes it fast to read and easy to understand. You may miss instructions about which fingers to use. The thing is, though, that the same chord sometimes can be played with different fingerings. As a rule of thumb use what comes naturally for you and what doesn't involve unnecessary stretches. You can read more about this subject in the article How to place the fingers. Read also about How to read short notated chords.